On Sunday, I found myself with 15 egg whites (the leftovers from a misplaced foray into homemade eggnog) and about three hours before the DH and I were to host a Super Bowl party. 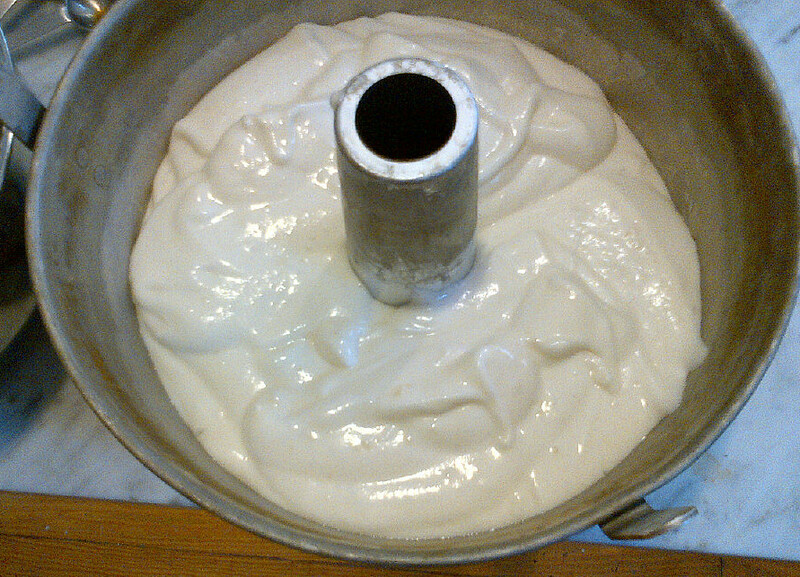 There was but one thing to do: Make angel food cake. 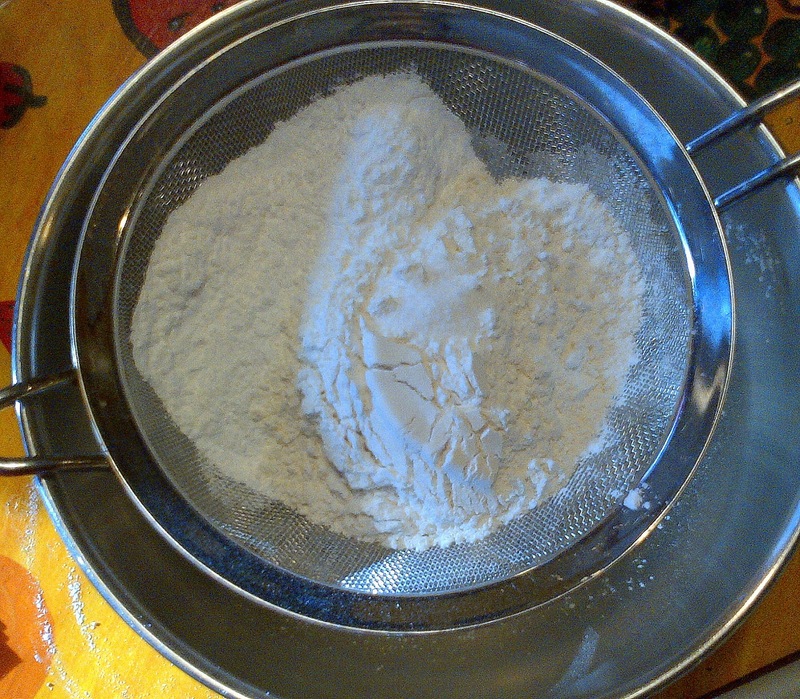 This wonderful recipe that consistently yields a perfect result, if you follow the recipe precisely, including sifting the dry ingredients two times. You don't need a sifter; just pass the ingredients through a strainer. 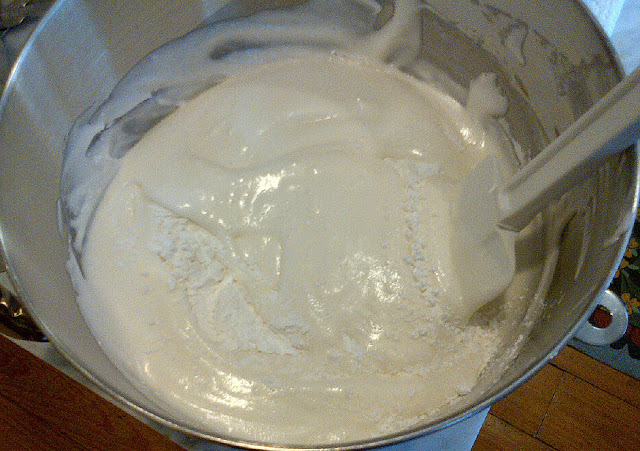 The dry ingredients are carefully folded into the whipped egg whites, using a large spatula. Spoon or pour the batter into an ungreased tube pan. Smooth the top (as I did right after snapping this photo). 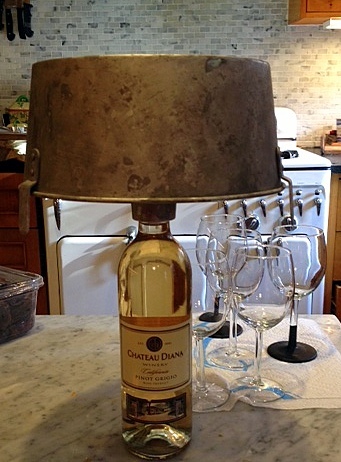 After pulling the cake from the oven, turn it upside down over an empty wine bottle. Not having one, I simply put it over a bottle of Chateau Diana, a vile "wine product" that no one should ever be forced to drink but somehow made its way into my liquor cabinet. At last, I found a good use for it. 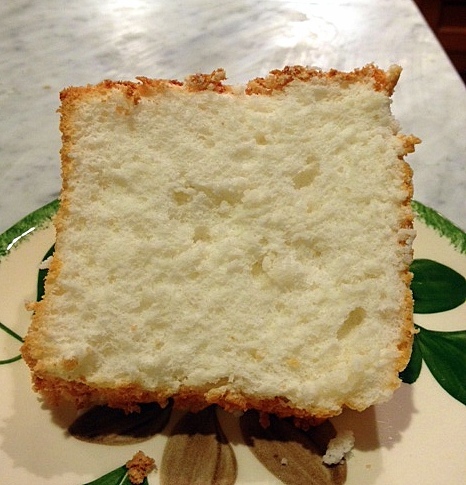 Angel food cake has no fat, but plenty of sugar. It's great served plain, or you can ramp it up a bit with a sauce. I made a sour cherry sauce, which didn't photograph well -- the cake looked like it was bleeding, so best to leave it on the side. Always good to add a tried and true recipe to the collection. 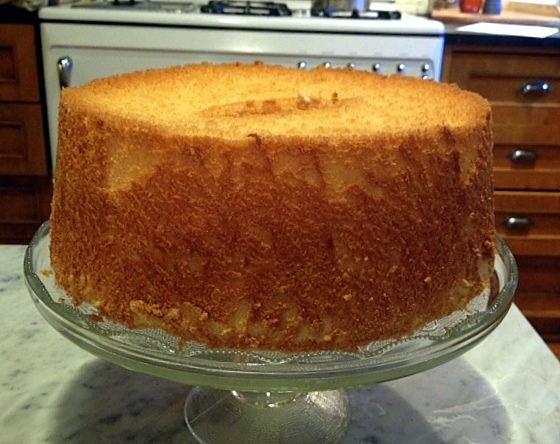 Of all the angel food cakes I've ever made, the only one that was an epic fail was one I made in culinary school. At least we weren't being evaluated that day. C'est la vie. It looks like its good tasting bread. Thank you for sharing this one. 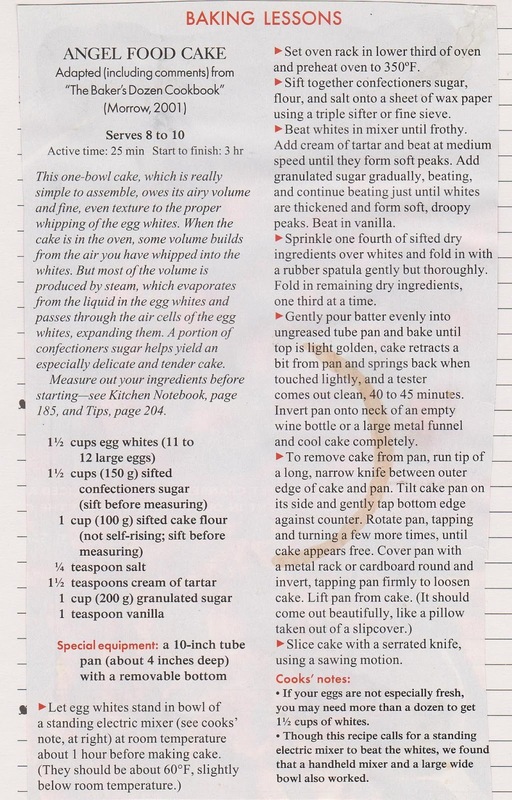 Hope to see more instruction on how to bake it. 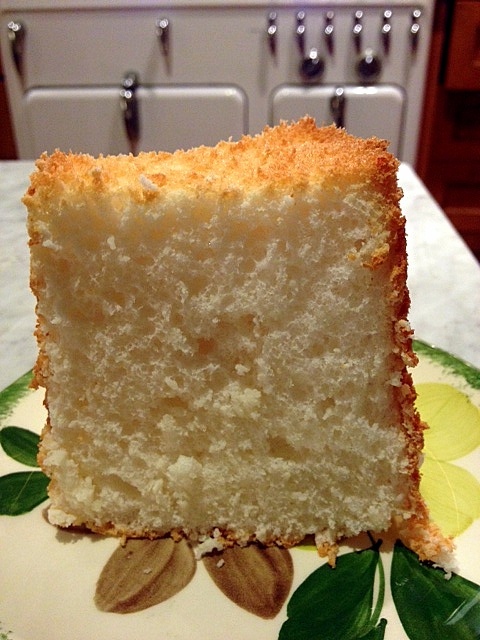 It always makes me feel a little like a heathen to admit that I hate angel food cake. It's so pretty (yours looks gorgeous) and versatile that I probably should love it, but I definitely do not. 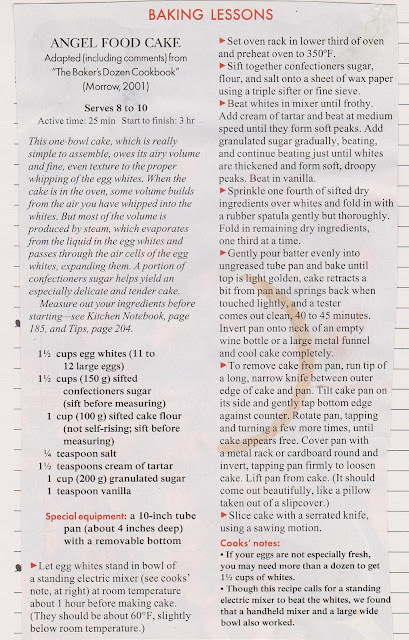 Whenever AFC is a component in a dessert I want to make, I use pound cake instead. I picked one up at a thrift shop not long ago just because. Just found your blog this week thru pinterest somehow. However, we give up sweets for Lent, so it's killing me that I can't make anything! I'm still having a great time reading. Keep up the good work! Do You Write in Your Cookbooks?